Dangerous Beauty Honor Roll: Want to know who else thinks Brazilian Blowout should be illegal? Over the last few weeks, we’ve been sharing information on the dangers of formaldehyde-laced hair straightening products, including the infamous Brazilian Blowout, among others. The FDA recently issued a warning to the makers of Brazilian Blowout, and increasingly salon professionals are demanding that it be recalled. Recently the National Healthy Nail and Beauty Alliance demanded that the FDA immediately recall Brazilian Blowout and similar products. According to the FDA, the cosmetics industry’s own safety review board issued an opinion critiquing the safety of straighteners that use formaldehyde. OSHA has issued a national hazard alert. And this year the National Academy of Sciences (NAS) released a report on formaldehyde that confirmed the EPA’s determination that it causes cancer. The FDA does not have the ability to ban a beauty product. It can only issue a “voluntary recall,” meaning that it cannot mandate the removal of dangerous products from the market. Many other countries, however, have made hair-straighteners with formaldehyde illegal, including Australia, Canada, Ireland, France and Germany. So, who thinks we should stop using these formaldehyde-based hair straightening treatments? Well, obviously a whole lot of people. This entry was posted in Cancer, Formaldehyde, Salons and tagged beauty salons, Brazilian Blowout, Dangerous Beauty, formaldehyde beauty products, hair stylist on October 24, 2011 by Charlie Domer. 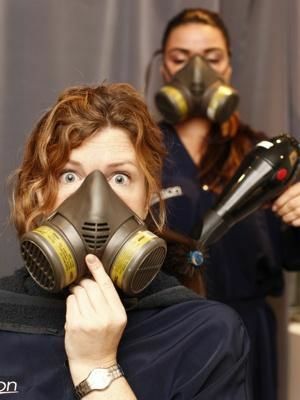 The formaldehyde in Brazilian Blowout products is dangerous for both stylists and their clients. This is the second installment in our series on the dangers of hair-straightening products with formaldehyde. For many of us, the word formaldehyde conjures up images of high school biology class, and glass jars full of preserved frogs. But for Molly Scrutton, a stylist from Portland, Oregan, it most likely calls to mind the sore throat and aching chest she felt after giving her clients the Brazilian Blowout hair treatment. After investigating and learning that other stylists had suffered from similar symptoms, Scrutton reported it to local health officials. 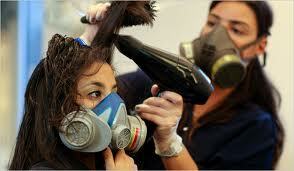 Since then, Brazilian Blowout has been found to contain over 10 times the amount of formaldehyde considered safe. Formaldehyde does terrible things to the body. Formaldehyde can irritate the eyes and nose, causing coughing and wheezing. It can cause allergic reactions of the skin, eyes and lungs, such as asthma-like breathing problems, skin rashes, and itching. Effects reported by users of formaldehyde-laced hair straightening products include eye disorders, nervous system disorders, respiratory tract problems, chest pain, vomiting and rash. If you have been exposed to a hair straightener and suffer from any of these symptoms, you should seek medical treatment immediately. Sometimes the effects of formaldehyde exposure are irreversible or fatal. This entry was posted in Formaldehyde, Salons and tagged Brazilian Blowout, Dangerous Beauty, formaldehyde, formaldehyde beauty products, hair products, hairstyles, stylists on October 10, 2011 by Charlie Domer. It all started a little over a year ago, when an Oregon hair stylist reported difficulty breathing, nosebleeds, and eye irritation after using the popular Brazilian Blowout hair-straightening product on her customers. Based on her referral, Oregon’s Occupational Safety and Health Division, and eventually the national Occupational Safety & Health Administration (OSHA) began testing hundreds of hair straightening products. They found formaldehyde, an irritating and carcinogenic substance, in many of them. 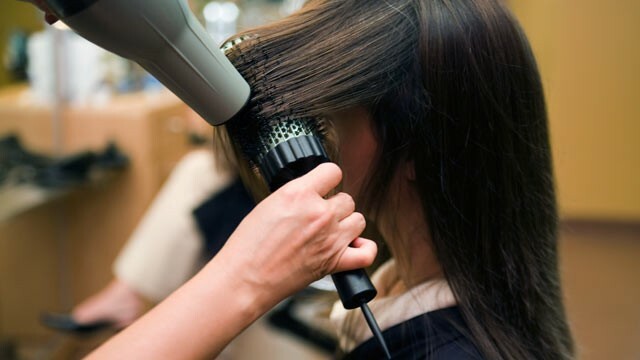 In particular, the product called Brazilian Blowout, which is falsely labeled as formaldehyde-free, was found to contain dangerous amounts of the substance. They found formaldehyde, an irritating and carcinogenic substance, in many of the products. Well, now the FDA has also issued a warning letter to the makers of Brazilian Blowout saying that the levels of formaldehyde in their product are extremely high. In the FDA’s tests, levels of formaldehyde in samples ranged from 8.7% to 10.4 %, more than 10 times higher than the 0.2% that is considered safe. This entry was posted in Formaldehyde, Salons and tagged beauty salons, Brazilian Blowout, formaldehyde beauty products, hair stylist on October 3, 2011 by Charlie Domer.